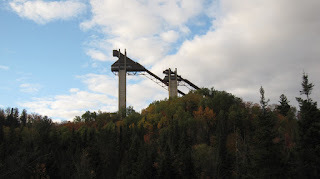 After twenty-five years of passing today's featured photo, the Ski Jumps from the 1980 Olympic Winter Games, one is bound to get used to seeing these odd shaped pieces of cement rise out of the AuSable River and surrounding pine trees. They are now just part of the scenery for me on my daily commutes in or out of the Village of Lake Placid. Apparently, however, for all those people who ignore the "No Stopping" signs and stop their cars in narrow, dangerous areas in order to capture an image of the ski jumps, the Olympic Ski Jumps are something special. It is leaf peeper time in the Adirondacks and when you combine the foliage seekers with usual Olympic shutter bugs, the resulting road rage is inevitable. I can't say I blame them. "The jumps," as they are known locally, are very cool to see. A surprise at first glance, they appear suddenly as one turns around and drives down the hilly curve on the road to the Village. On second consideration, the ski jumps seem to belong exactly where they are. They are settled in and actually appear to be growing along the river, ahead of the trees a few decades in maturation. This is probably why I find them so aesthetically attractive. Although the structures themselves were made by men, their architecturally lines are natural; inspired by necessity to replicate a mountain. I still remember the first time I saw them as a visitor 26 years ago. Fortunately for local athletes, like all the 1980 Olympic venues, the ski jumps are still maintained and operational. Children who participate in organized training programs here learn to ski jump as young as six years old. They can eventually compete in FIS international ski jumping events such as World Cups and of course, the Olympic Winter Games. The Adirondack region consistently produces very successful Olympic-caliber winter athletes. Seeing the jumps reminds me of the fun we had when my son participated in the "Grass Hopper" ski jumping program many years ago. Training with the New York Ski Education Foundation (NYSEF), he was six years old and just learning the sport. He was so young and such a little guy his helmet seemed larger than his body. Fortunately, he started jumping on a relatively small jump; the 10 meter hill. As his skills progressed, he graduated to larger hills, until finally it was time to address the 70 meter hill; the smaller of the two jumps shown in the photo. From my perspective, it had become increasingly difficult to watch my baby fling his body from increasingly higher heights. It was at this point in his ski jumping career that I mentioned the horribly painful procedure he would soon endure should he continue to compete as a serious ski jumper. I reminded him birds have hollow bones which make them lighter so they can fly. I explained to him when US Skiing officials decided an athlete had ski jumping potential, they sent the child away to have the marrow sucked out of their bones in order to make them as light as possible. Naturally, he would also be fed a special, although very restricted, ski-jumper's diet with no spaghetti, carrot cake or venison burgers allowed. I don't think Eddie believed me, but I certainly breathed a sigh of relief when he decided to concentrate on ski racing and passed on the 70 meter hill. Although I don't recommend jumping, I highly recommend taking the Olympic Regional Development Authority (ORDA) visitor's elevator to the top of the ski jumps for an incredibly beautiful view. The jumping complex itself also makes an interesting tour. Lake Placid Ski Jumps in the Fall photograph courtesy of Joann Sandone Reed.